Adam Lyth made 194 for Yorkshire against Leeds-Bradford MCCU at Headingley (Picture: Jonathan Gawthorpe). ADAM LYTH narrowly missed out on scoring his fifth double hundred for Yorkshire yesterday and equalling the tally of the great Len Hutton. Lyth hit a brilliant 194 as Yorkshire made 543-5 declared against Leeds-Bradford MCCU on day two of the three-day match at Headingley, Leeds-Bradford reaching 40-0 in their second innings, a deficit of 366. Hutton, Maurice Leyland and Yorkshire’s director of cricket Martyn Moxon all hit five double hundreds for the club during their distinguished careers. It puts Lyth’s achievements into perspective and, aged 29, he still has plenty of time to overhaul that distinguished trio. Beyond that, the only more prolific double centurions for Yorkshire have been Herbert Sutcliffe (15 and one triple century), Percy Holmes (seven and two triples), and Geoffrey Boycott (seven). Lyth has a happy knack of “going big”, as they say, and he proved it again before being bowled by seamer Will Cook. For the record, Lyth’s double hundreds are 248 not out against Leicestershire at Grace Road in 2012, 230 against Northants at Northampton in 2014, 251 against Lancashire at Old Trafford in 2014, and 202 against Surrey at the Oval last year. His latest marathon lasted for eight minutes over six hours, during which time he faced 278 balls and struck 21 fours and four sixes. Having scored 1,153 first-class runs last season, the signs are good for Lyth again this year. Ditto fellow opening batsman Alex Lees, who made a splendid 100 on the opening day after Leeds-Bradford had been dismissed for 137 in their first innings. Yorkshire’s reply proceeded in similarly effortless vein yesterday as the hosts made hay in the Headingley sunshine. Lyth, 61 overnight, reached his 21st first-class century from 152 balls with 12 fours and two sixes, the two maximums both savage pull strokes on the first day. He lost Eliot Callis early on yesterday, the 22-year-old right-hander trapped lbw by Oliver Bocking for 17, but, having added 174 with Lees for the first wicket, Lyth found another durable ally in Gary Ballance, with whom he shared a third-wicket stand of 154 in 37 overs. It was comfortable stuff for the Yorkshire pair, who, not so long ago, were making runs against international attacks, let alone student ones. That is not to decry the efforts of the Leeds-Bradford bowlers, who toiled manfully in the fine conditions, but the gulf in class in this game has been glaringly obvious. After reaching a half-century from 88 balls with seven fours, Ballance also looked set for a hundred, which would have been the 30th of his first-class career. Having advanced to 72, the Yorkshire captain was brilliantly caught by a diving Martin Andersson at square-leg as he pulled Ben Shoare. Lyth continued on his merry way, easing past his previous highest first-class score at Headingley of 143 against Durham in 2014. The left-hander seems to enjoy playing against Leeds-Bradford; this was his third century against them and a high-class display. However, with the tea interval just starting to drift into view, Lyth fell with the total on 439 having hitherto looked untroubled. The dismissal seemed to happen in slow motion, the 200 or so spectators gradually registering the fact that Lyth’s broad bat had somehow missed the ball. It is no secret that Yorkshire’s top-order batting has struggled collectively in recent times, with the club anxious to find greater consistency from their frontline players. As such, the performances of Lyth, Lees and Ballance were clearly welcome, while there was further good news in the form of fine innings from Jack Leaning and Tim Bresnan, who made 64 not out and 46 respectively. Last year, Leaning managed 233 runs in nine Championship games, making more of an impact in limited-overs cricket. Runs from the 23-year-old here were just what the doctor ordered, and it was unpleasant medicine for the Leeds-Bradford bowlers, who found him at his determined best. One glorious punch to the mid-on boundary off Daniel Houghton stuck in the mind as Leaning advanced to his half-century from 89 balls. Bresnan has been in prime batting form for some time and simply carried on from where he left off as he showed a tight defence allied to a natural attacking instinct. Bresnan added 80 in 15 overs with Leaning before being trapped lbw by Ollie Graham. Yorkshire declared with 50 minutes remaining as Ballance set his bowlers to work. 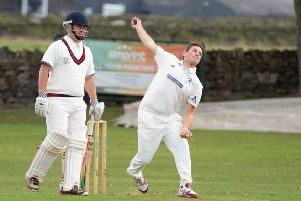 But openers Steve Bullen and Ben Shoare did their side proud as they survived the 11 overs sent down.